Thank you for  all  the joy and pain. Go Dutch treat, you were sweet. Thank you for fun - ny cards from Spain. I confess, that's not all. Yours and mine, that was fine. Thank you for  see - ing me again. My heart says, danke schoen. Danke schoen,    auf - weid  - er - sehn. 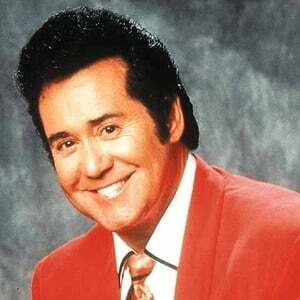 Carson Wayne Newton (born April 3, 1942 in Roanoke, Virginia) is an American singer and entertainer based in Las Vegas, Nevada. He performed over 25,000 concerts in Las Vegas over a period of over 40 years. Newton was born to Evelyn Marie "Smith" (née Plasters) and Patrick Newton, who was an auto mechanic. His father was of Irish-Powhatan descent and his mother of German-Cherokee ancestry. While his father was in the U.S. Navy, Newton spent his early childhood in Roanoke.